A new paper from our team has just been published in the journal Animal Behaviour. The paper focuses on bystander post-conflict affiliation (i.e. the friendly post-conflict interaction between one of the former opponents and an individual not involved in the conflict) and it is one of the first studies to provide evidence that non-anthropoid primates (e.g. macaques and baboons) can display such conflict management strategy. Here is the full reference to the paper and the abstract…we hope you enjoy it! The majority of studies investigating conflict management in animal societies have focused on the role of reconciliation in mediating the costs of aggression. The function of bystander affiliation (i.e. the selective attraction between an opponent and a bystander in the minutes immediately following aggression) is less well understood. 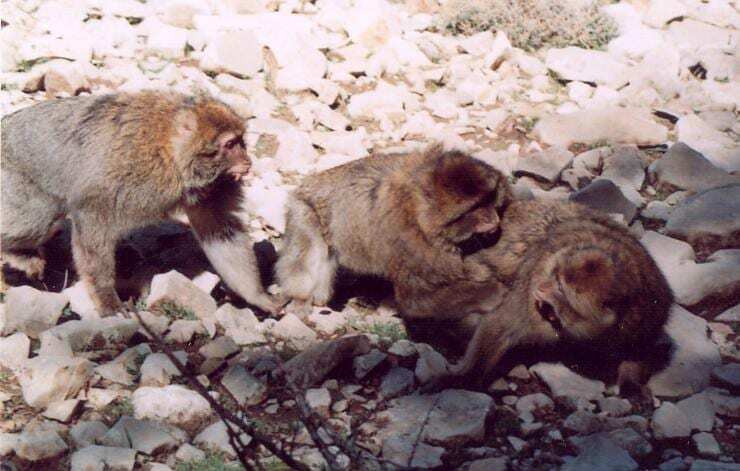 We examined, in wild Barbary macaques, four potential functions of bystander affiliation with the victim of aggression: (1) bystander-initiated affiliation to reduce the victim’s postconflict (PC) anxiety (i.e. ‘consolation’), (2) victim-initiated affiliation (i.e. ‘solicited consolation’), (3) victim- and bystander-initiated affiliation to avert redirected aggression (i.e. self-protection), and (4) bystander-initiated affiliation to exploit grooming from the victim. We found partial support for the consolation function as bystander-initiated affiliation occurred more frequently between high-quality social partners but had no effect on the victim’s PC anxiety. In support of the solicited-consolation function, victim-initiated affiliation occurred more frequently between high-quality social partners and also caused a reduction in the victim’s PC anxiety. These findings suggest that solicited consolation may substitute for the stress alleviation role of reconciliation. We found no support for a self-protective function as neither the bystander’s nor the victim’s risk of receiving PC aggression was reduced following bystander affiliation with the victim. Finally, bystanders received significantly more PC grooming than victims, suggesting that grooming exploitation of the victim may drive the bystander’s PC behaviour. Our results indicate that bystander affiliation has different functions and benefits for the victim of aggression and the bystander, and highlights the importance of considering which individual initiates this behaviour.